On Friday May 27, 2011 between 7:30 and 8:30, I Have a Dream will be opening its doors to the community. The Open House will be hosted by Scarborough Arts and the IHAD Youth Collective. If you have any questions, please contact Jen at 416.698.7322 or ihad@scarborougharts.com. See you there! Stage 2 Contemporary photos are up! Have a look at them! Enjoy and see you on Friday! The second genre of I Have a Dream has officially begun! We had a great workshop last week with Melissa Noventa, who taught the movements and stories of Cuban/Brazilian dance. Photos from last week’s workshop will be posted tomorrow, so make sure you check back! Tomorrow, we will be Jennifer Robichaud and she will be starting us off with our Contemporary genre and will be with us for the next seven weeks. Make sure you bring your dancing shoes; Jennifer is pumped to kick off this new genre with you! In addition, please have a look at the following curriculum for Stage 2. Within the outline are a lot of the things we touched based on during our last few IHAD meetings as well as some of my notes. If you have any questions regarding it, please contact me directly and we can address any concerns together. At the moment, I am working on the Curriculum for Stage 3. Tomorrow, instead of having a meeting between 4:15 to 5:15, we are going 8:15 to discuss. We may go until 9:00, seeing that our meetings usually go in-depth so just be prepared to stay and discuss. Collective will experience the authenticities of Afro and Brazilian dance with special guest instructor, Melissa Noventa. Participants will experience dancing with live African drummers and learn the movements of African dance. Prior to the workshop, IHAD Collective members will have a meeting at the McGregor Lounge from 4:15 to 5:15. After the meeting, the Collective will be introduced to the movements of the Contemporary genre with Contemporary instructor Jennifer Robichaud. The Collective will learn the movements and basics of the Contemporary movement. Collective will also start the beginning phases of the Contemporary routine to be performed. *Pieces of the Contemporary genre will be added to the Hip Hop genre’s performance to make an overall performance for the video shoot in late June. Collective will continue practicing the Contemporary routine from 5:15 to 7:25. At this point, the Collective should have a good portion of the Contemporary routine rehearsed and memorized. Collective will continue practicing the Contemporary routine and will continue to add Contemporary elements to their routine. As each week passes, participants MUST have the routine memorized and practiced to the point that they could rehearse it without the instructor’s aid. At 7:00, doors will be open to the public. If anyone wishes to view what occurs during the IHAD workshops, they are welcome to come early before the actual Open House itinerary begins. At 7:30, IHAD Collective will follow set itinerary for the rest of the evening. The Contemporary Genre’s workshop will be taught between 5:15 and 7:25. At this point, there will be no new additions or changes to the Contemporary routine. The Collective should have the Contemporary routine memorized and refined by the end of this workshop. From 7:30 to 8:30, the Collective will gather for a meeting regarding the dance video shoot. The meeting will be facilitated by Jen Fabico. At this point, the Collective should have the entire Contemporary routine memorized. Both Jennifer Robichaud and Jase Cozmic will be in attendance during this workshop. Together, the youth Collective and the instructors will decide which the new form of the routine. The routine will include all of the elements from the Hip Hop routine as well as the Contemporary routine. Before the end of the workshop, the overall routine containing both genres will be decided, rehearsed and filmed as a reference. The Collective will continue to practice the routine as decided from the prior week. There will be NO CHANGES to the routine from what was decided last week. Throughout the entire length of the workshop, participants will continue the practice the same routine until the point of memorization. Before the end of the workshop, each member of the collective should be able to rehearse the entire routine individually and memorized without any prompting. In addition, the collective will work together to perfect any flaws. At this point, instructors should be able to step back and allow the Collective to perform with minimal aid. The Collective will continue to rehearse their Contemporary routine. Last week, the Collective will have memorized the entire routine as individuals. This week, the Collective will continue practicing the same routine with the assistance of Jennifer and Jase. At this point in the genre, the instructors should be able to step back and allow the Collective to perform their perfected routine without ANY aid. **By the end of this workshop, the Hip Hop/Contemporary routine will be flawless and ready for performance. At 8:00, there will be a final preparation meeting facilitated by Jen Fabico. The Collective will be performing the Contemporary/Hip Hop routine for IHAD’s first video shoot. The Collective will gather this evening one hour before the video shoot to run through any last minute questions or concerns. The video shoot will occur for two hours in the evening of June 28 at a location that is yet to be determined. 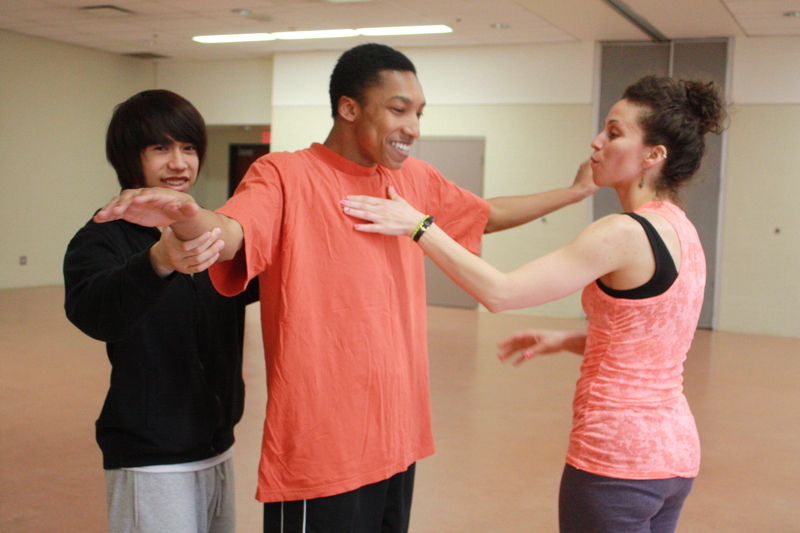 IHAD Program: Workshop #8 - Justin, Emil and Sam perform experimental dance. Last night we spoke about the video shoot coming up in the second genre. The proposed date for the shoot was on Friday June 24th but it looks like that may not work with everyone. Let’s try to find a day that works for everyone before this Friday (April 22nd). Have a look at the following days and tell me which days you are available. Try to keep as many days open as you can since everyone will have different availabilities. So far Thursday June 30th has been a preference for those who have replied. Hopefully we can make this the new proposed date. EMAIL ME YOUR PREFERENCES A.S.A.P. !